Dr Robert Kushner is a renowned expert in the field of nutrition and obesity. His Personality Type diet is an innovative approach to weight loss – based on food and behavior. Successful trials were undertaken at the Northwestern Memorial Hospital’s Wellness Institute in Chicago, IL, and the diet has received many endorsements (including the respected Mayo Clinic). Dr. Kushner ‘s book includes a survey consisting of over 70 questions about your eating habits. The survey results indicate an eating pattern – many of which Dr. Kushner has named (hearty portioner, fruitless feaster, nighttime nibbler, and many more). The program will also determine your exercise personality and coping personality. It is these three elements combined that will contribute to a successful weight loss program. By combining the results of all three personalities, the Personality Type Diet will craft a program based around your current habits. Weight loss is as much about altering behavior and habits as it is finding a good diet plan. The Personality Diet creates meal plans using a large selection of healthy foods – as well as fast food options. It is not a restrictive diet but something that includes a good balance of carbohydrates, proteins, and fats. There are 3 main meals and 2 snacks included in the menus. Portions and quantities are determined by your own statistics. Squeeze ½ lemon over salmon and sprinkle with fresh dill. Cook salmon in aluminum foil at 350 degrees until fish flakes easily with a fork, about 15 minutes. Spray a baking dish with non-stick cooking spray. Place 5 spears of asparagus, 1 sliced yellow squash & 1 minced garlic clove in the dish and drizzle with 1 tsp olive oil. Bake with salmon, putting veggies in first for about 25-30 minutes or until easily pierced with a knife. Find some other healthy meal suggestions here. Dr. Kushner believes that people should exercise in a way that fits their personality type and in turn, this improves their sense of mood and wellbeing. 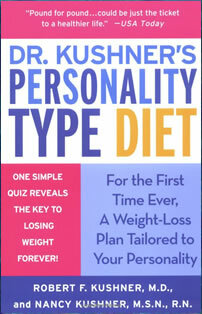 Dr. Kushner’s Personality Type Diet retails for $22.95. Click Here to purchase this diet online. The Personality Type Diet is a superior weight loss diet, proven in Dr. Kushner’s weight loss clinic, and now with tens of thousands of successful clients. what is the easiest, and fastest diet you know?? ?